DERIVATION: Eschricht refers to a 19th Century Danish zoology professor; from the Latin robustus for oaken or strong. The gray whale is best known for its annual migration north and south along the coast of western North America. This 10,000-14,000 mile round trip is among the longest known of any mammal, and, in many instances, brings the whales within viewing distance from land. 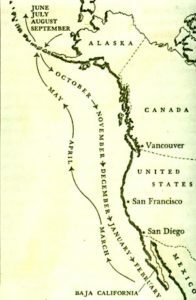 Their journey begins in fall when temperatures begin to drop in the circumpolar seas surrounding Siberia and Alaska. 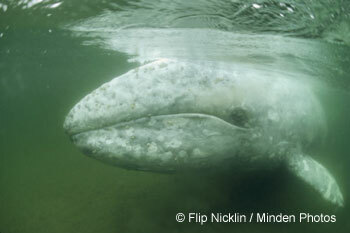 The gray whales have spent May through November feeding in the food-rich Bering, Chuckchi and western Beaufort seas. Their lengthy migration will take them to the temperate waters of Baja, California, where mating occurs and calves are usually born. Yankee whalers discovered the Baja lagoons in the 1850s and their slaughter of gray whales brought the population to commercial extinction in just 18 years. Whalemen would harpoon calves in order to get their mothers within range. The beleaguered mothers would aggressively defend their calves by ramming and smashing boats. They would "fight like devils" and hence were named "devilfish." After the turn of the century, gray whales were again decimated when floating factories (which process whales) were introduced. In 1946, by international agreement, gray whales were given protection from commercial whaling and their population has grown to its current estimate of 21,000. This is believed to be close to its pre-exploitation stock size. It is the only baleen whale to have recovered from commercial whaling. In addition to its marathon migration, the gray whale has other unusual characteristics. It is considered the most primitive whale, or the one most like the common ancestor of all whales. It is the sole representative of the family Eschrichtiidae and the only whale to range in the comparatively shallow waters of the continental shelves. Gray whales are baleen whales. 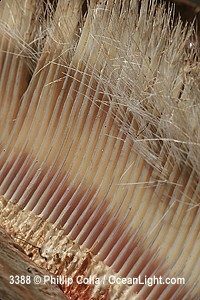 Baleen is a giant filter-feeding device and consists of fringed plates which overlap and hang from the upper jaw (130-180 on each side). The plates consist of a material called keratin which is the same substance found in human fingernails. 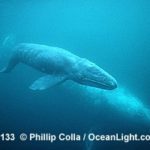 Unlike other baleen whales, gray whales usually feed on the ocean bottom. They scoop mouthfuls of bottom sediment and, after filtering it through their baleen, retain the living organisms. This feeding technique is also considered primitive. The gray whale is about 17 feet long at birth and reaches a maximum size of approximately 45 feet; females are larger than males. It has no dorsal fin, but a series of from six to twelve knuckle-like knobs along the dorsal ridge. Its color is mottled gray, sometimes with patches that are very pale or white. A distinctive feature is their barnacle clusters, which are usually on their head and back. Whale lice are orange-colored crustaceans that inhabit the same areas and folds and grooves, as well as the open surface of the skin. The top of their tapering jaw has pits or depressions, each containing one stiff hair. Life expectancy is about 50 years. 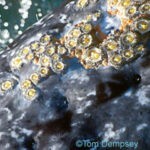 The skin of this swimming gray whale sports hairs and barnacles. This friendly whale nuzzled our small boat at San Ignacio Lagoon, Baja California, Mexico. Sexual Maturity: 11.1m, males; 11.7m, females and occurs between five and eleven years of age. Females bear a single calf at intervals of two or more years. Calves appear to be weaned in nine months, in time for the fall migration. Diet: amphipod crustaceans, polychaete worms, crab larvae, small fish, crabs and possibly plants and seaweed. Enemies: killer whales (Orcinus orca) may be a significant cause of gray whale deaths, particularly of young migrating whales. There are numerous reports of killer whales feeding on tongues of gray whales and leaving the carcasses. Scars from killer whale teeth are often observed on gray whales. Large sharks in the calving lagoons may be responsible for some calf death. A major concern along the west coast is the increasing entanglement of gray whales in fishing gear and nets. In the Southern California area, the number of gray whales seen migrating along the coast has dropped. It could be attributed to a variety of factors, but the aggressive tactics of recreational boaters is believed to harass the whales. Gray whales were removed from the Endangered Species list in early 1993 and are now a "protected" species. Save The Whales was opposed to their delisting for several reasons: it could diminish protection from noise pollution (caused by drilling or boat traffic); it could increase the possibility of oil exploration in their migration routes; and because of potential dangers from lack of genetic diversity and absence of genetic studies. Furthermore the effects of chemical pollution on future generations pose very serious questions that lack answers. A threat now comes from the Makah Indian tribe of northwestern Washington and their efforts to resume hunting of the grays. Save The Whales has received complaints from US citizens who have traveled to Magdalena Bay in Baja, Mexico, for a relaxing whale watching vacation and leave horrified as to the lack of concern for safety of the whales. Boats will completely surround the whales and have even been seen running over them. If you have had this experience, you can voice your concern and ask the Mexican government to correct this situation and to provide needed protection for the gray whales. Many of them are mothers with new-born calves. Sign up to receive the latest news from Save the Whales.